His main intention is to make the illiterates atleast to write and read. Finally his main ambition is to improve atleast somebody who are suffering from English. Personal pronouns take the place of specific nouns (the names of people, places or things). Basically, they are used instead of a specific name to avoid repetition and to help ease the flow of sentences. 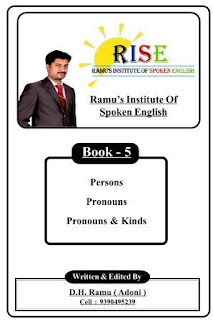 We usually inject personal pronouns into a sentence when the name of the noun has been previously mentioned, so that the reader will know what is being referred to.